New York, NY (June 23, 2015) – Tura Inc., the inventor of fashion eyewear in 1938, debuts its Universal Fit collection from the quintessentially British Ted Baker line, featuring comfort models for Asian women and men customized to their facial structures. The eight (8) subtly branded frames – four women’s and four men’s – are made from rich, laminated acetate material. The designs include structured plastic bridges with deeper nose pads. Additionally, two models are offered with adjustable nose pads. A four base curve frame front, proper screw-to-screw width and bowed temples make these models a requirement in any office that serves the Asian community. Colors have been specially developed to compliment the skin tones of the targeted demographic. These special fit features are offered with Ted Baker design and branding. Excellent wholesale pricing makes this collection an excellent option for customers that desire luxury, quality and styling at an affordable price point. The easy-to-wear shape was born from the need to appeal to a wide array of wearers. It is a gently modified rectangle, discreetly identified with Ted Baker on the temple. The adjustable nose pads set it apart from the others. Available in black, which is laminated with red tones and tortoise. While style B727 is conservative to appeal to a wide array of wearers, Model B728UF is on the bold and edgy side. This retro inspired soft square is a popular trend shape. The double rivets on the side of the temple emphasize the retro roots. The plastic is contoured and thicker to create a more youthful and bold look. 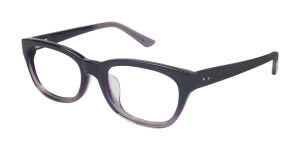 Available in deep purple into a translucent fade and tortoise. This style brings a contemporary edge to the Universal Fit collection. Rectangular in shape, laminated for color and accented with metal – this model is based on a best-selling Ted model that will never go out of style. Its adjustable nose pads and spring hinges provide a comfortable fit. Available in brown, laminated on blue and black laminate on grey. Both colors include metal accents with like hues. An easy-to-wear shape with a progressive friendly depth that appears slimming, appealing to a wide array of wearers. Rich laminated zyl and subtle branding identified on the temple makes this style understated and classic. Available in black and tortoise. Tura Inc. is a leading optical design house based in Manhattan. Since 1938 the pursuit of exquisite craftsmanship and a passion for innovation have defined Tura as a fashion leader. Tura’s inspired vision of eyewear as a fashion accessory gave rise to a series of industry milestones, including an exclusive partnership with Vogue magazine and the industry’s first designer brand license with Christian Dior. Today, Tura employs over 200 people in North America. The Tura Inc. brand portfolio includes: Tura, Ted Baker, Lulu Guinness, Brendel, Geoffrey Beene, Humphrey’s and TITANflex. Tura is a member of the Eschenbach Group of Germany. For more information, please visit: www.tura.com.